About 28 years ago, someone handed me a book. Since I was (and still am) a horseman, the title of the book caught my attention. The book was: TOM BASS, BLACK HORSEMAN. I read that book from cover to cover and marvelled at the history that laid within its pages. He would often enter side competitions of which one was the slowest horse race. 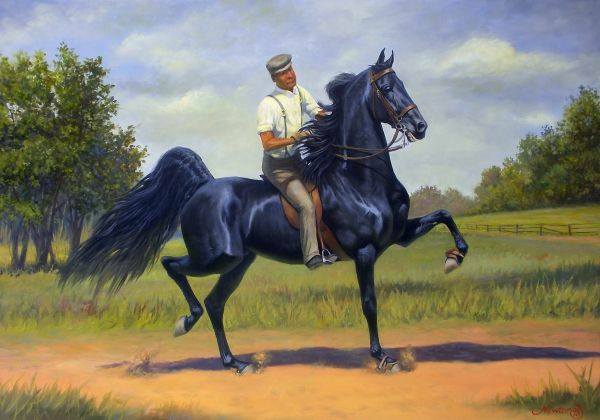 He challenged several other horsemen that he would race them and cross the finish line LAST! All of the competitors had to maintain their horses at the gait of a canter and the horse that could canter the slowest without breaking gait would be the winner. Until you read the story above, you probably never thought about coming in last and winning a race. You see, with Tom Bass, he was such a superb horse trainer that he had done what others could not do. You may have seen pictures of the horse that Buffalo Bill Cody rode. Tom trained that horse and sold him to Buffalo Bill. If memory serves me right, this is also the horse that Tom trained to canter so slow and eventually he cantered backward on him. Now getting back to business and entering races with your competition. While everyone is geared (or wired) to thinking about being first and beating out your competition, you might want to analyze your situation carefully. There are some races in business you just do not want to win! One such race that Seth Godin has discussed is, as he puts it, the race to the bottom. This is the race that no one in business should have a desire to win. However, this is the race that most businesses conduct themselves in each and every day. Most businesses try to “sell for less”. They try to impress their customers with giving them the lowest costs. What they are doing is racing to the bottom and whoever gets there first loses! You went thru years of school and maybe college and possibly business school. What did you learn? If you graduate at the top of your class, you can pick the best job out there? Bottom line is you learned how to compete to win. There’s another game in town and that is to cooperate to win!!!! Business is played with many rules. Rule number one is to out compete your rivals. Rule number 2 is to put a team together to accomplish rule number 1. In case you didn’t get the message, here it is again: Rule number 2 is to put a team together to accomplish rule number 1. If you want to be winning the game in business, then you need to completely understand what the preceding sentence refers to. If you don’t, you might want to TEAM UP WITH US HERE AT COMPUMATRIX. Google's Small World Wonderland: Just Amazing! You just won the Powerball Lottery: Now what?